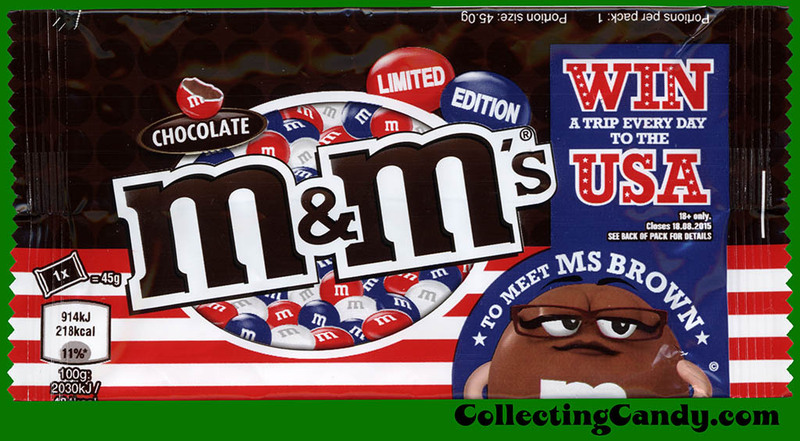 ← M&M/Mars’ 2001 Valentine’s Candy Sales Catalog! My Year in Collecting: 2015! 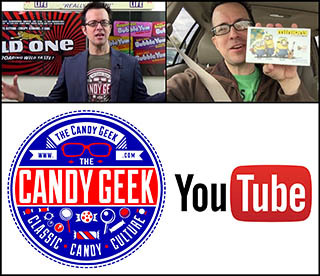 As I have for the past six years, today I will be taking a look back at the past twelve months of my hobby life, bringing together some of my favorite additions to the CollectingCandy.com archives. So make the jump to take a look at the 2015 edition of “My Year in Collecting”! Bringing these visual collages together is a fun opportunity to look back on this particular subject matter and passion but they also prompt a deeper reflection. So as I work on this piece, I consider the ups and downs of life, loved ones lost, new friendships forged, and the larger passage of time. And while this post could be considered merely a congress of colorful paper from our past, I’d like to think it is an opportunity to not only remember that which is behind us, but more importantly a prompt to celebrate and enjoy all that is around us now – right this very minute. Lots of wonderful colorful pieces in this year’s post. Many of which I’ve not previously published before. They run the gamut of items that I’ve been hunting for nearly my whole life to things I didn’t even know about before this last year. I’d like to highlight just a few now. 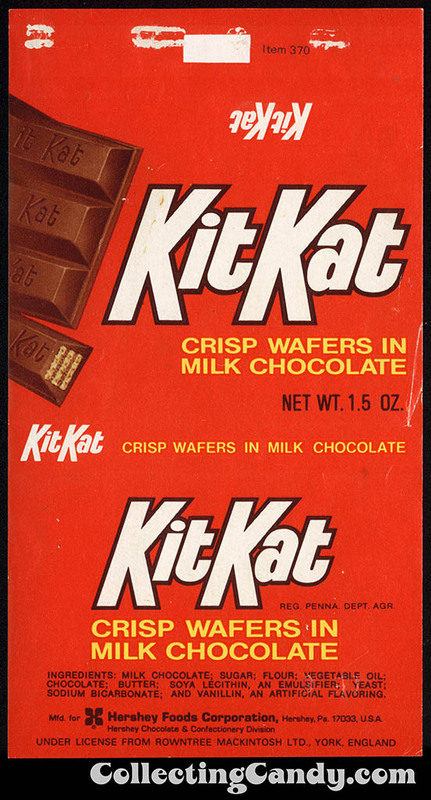 Next up is a non-candy item that I’ve been wondering about most of my life. 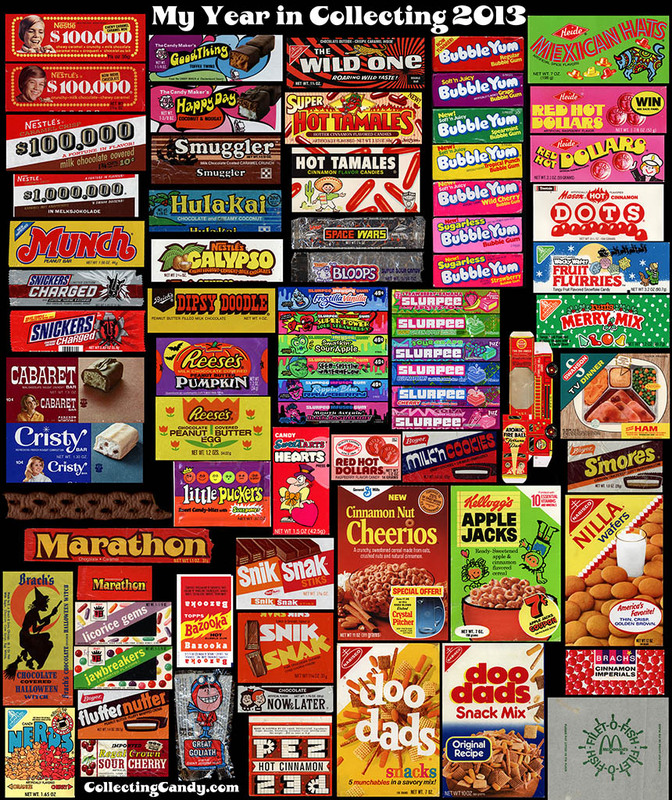 You see, it was early on during my grade school years in the 1970’s, first or second grade. A teacher brought in a treat for the class – a package of cookies that were made with each having a “monster bite” already taken out of them. 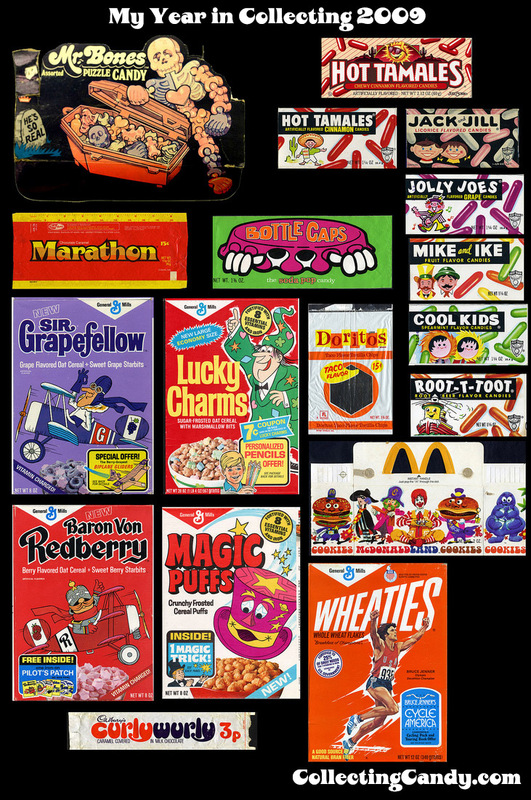 As a kid, I thought they were the coolest cookies to ever be produced, and when I arrived home that afternoon, I harassed my mother to “find some monster cookies”. She would end up going to several local grocery stores but never finding the cookies in question. 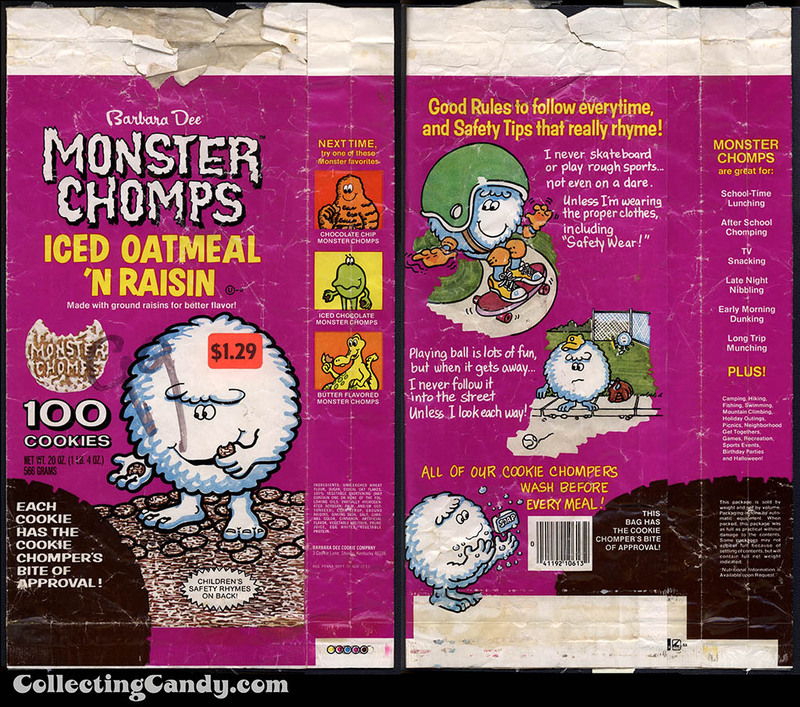 That’s an oatmeal/raisin flavor Monster Chomps – unlikely the version I loved as a kid. 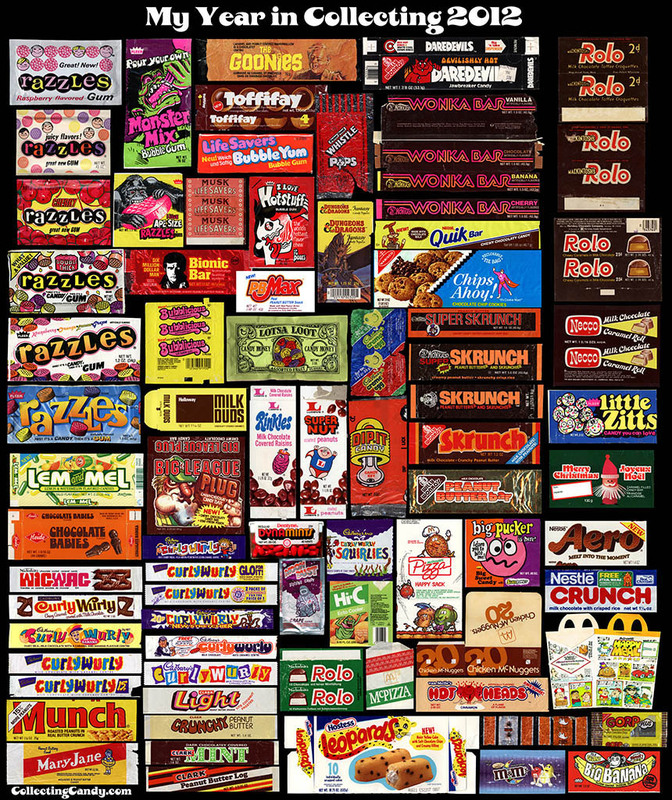 So, my quest isn’t over – I still need to find those other flavor packages! Next up is a piece that I’d been seeking for many years. 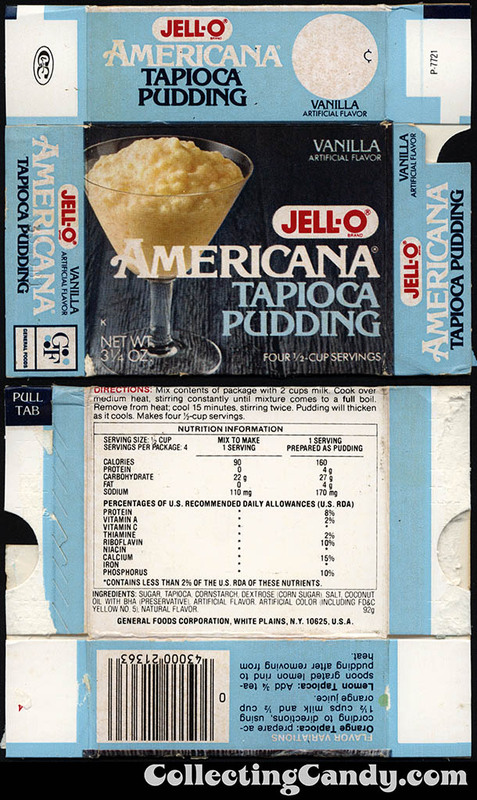 The reason being is that this package hearkens back to one of my favorite childhood memories – that being my grandmother’s house, and her habit of preparing Jell-O Tapioca pudding. I had hunted for this particular box for about a decade – the exact style she kept stocked in her cupboard – and finally one surfaced last year. 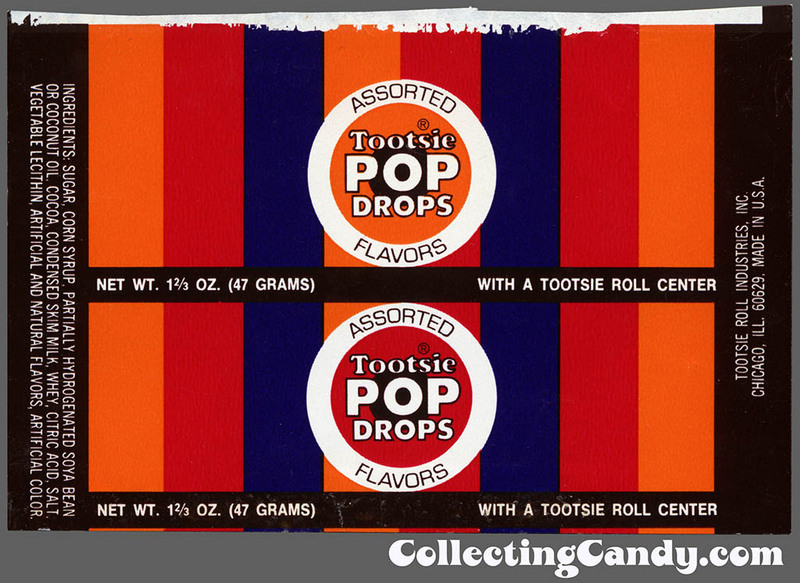 Finally, one last piece I wanted to highlight is a roll wrapper for the late 1970’s version of Tootsie Pop Drops – a childhood favorite of mine, and a wrapper that eluded me until I finally acquired one six months ago. It’s a beauty. That’s all of the items I wanted to especially point out, but every one of the items in today’s college are highlights of their own – all special pieces that I have been thrilled to add to my collection in the past year. 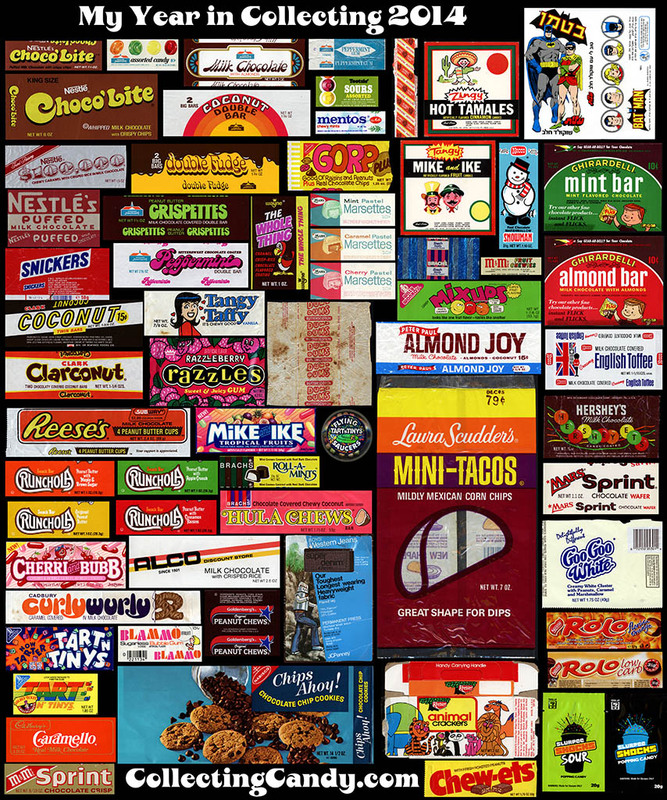 Next up, as is my year-roundup tradition, I will share each of the previous years’ graphical collages. 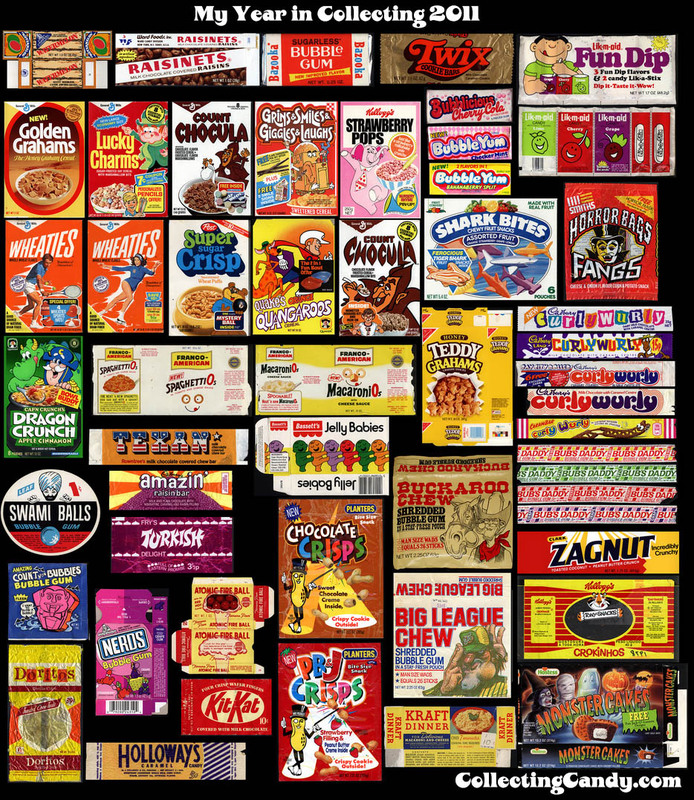 And that goes all the way back to the first year I put together my “Year in Collecting” graphic. It’s always fun to look back on the previous year, look forward to the next one, and make sure to enjoy where I am right this very minute. Hope you enjoyed this year’s edition, and I’ll see you next time! 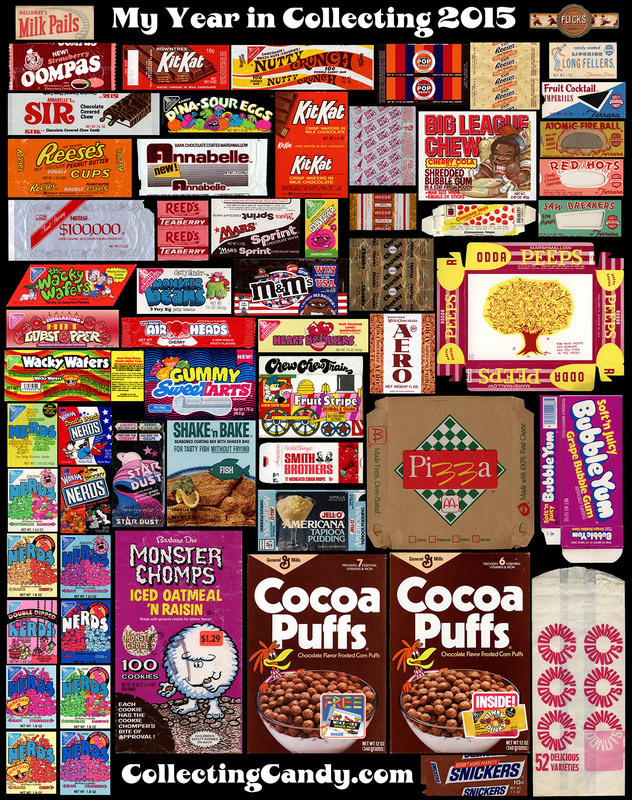 This entry was posted in 1970's, 1980's, 1990's, Chocolate, Hershey, M&M's, Wonka and tagged candy collecting, candy collection, candy collector, candy wrapper collection, candy wrapper collector, collectible, collecting candy, confectionery, confections, packaging, packaging design, sweets, vintage candy wrappers, wrapper. Bookmark the permalink. 4 Responses to My Year in Collecting: 2015! Congrats on another stellar year in collecting last year! 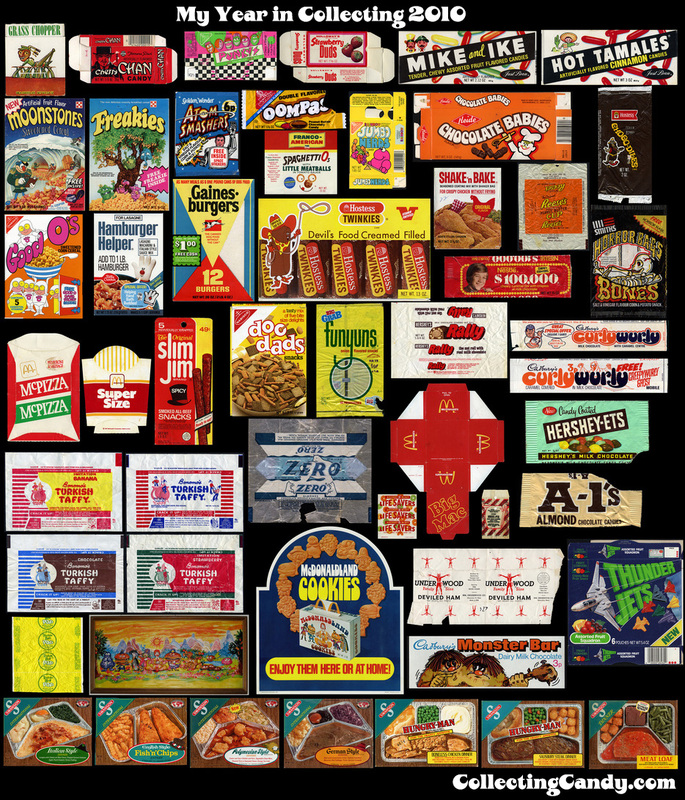 You’ve turned up some amazing items, many of which I had never seen before. Long long ago, there was cherry-vanilla Jello pudding. The “cherry” was probably grains of sugar that never grew up to be CrunchBerries. But I loved it anyway. Just now saw that you found a Monster Chomps bag…wow! Also the first one I have ever seen since I was a kid, and I’ve been hunting too…huge congrats!